Come visit MV Automotive in Auburn! We are proud to specialize in Auto Repair. As the premier auto repair shop in Auburn, our highly-trained automotive mechanics take great pride in supplying: Engine Repair, Brake Repair, Transmission Repair, and Auto Electrical Service. Each of our reliable specialists undergo extensive automotive repair training to meet all your auto repair needs. The maintenance experts of MV Automotive have been honored to serve Auburn for the past 10 years. While we focus on Auto Repair, Engine Repair, Brake Repair, Transmission Repair and Auto Electrical Service, we also provide a long range of other auto repair services listed on our services page. 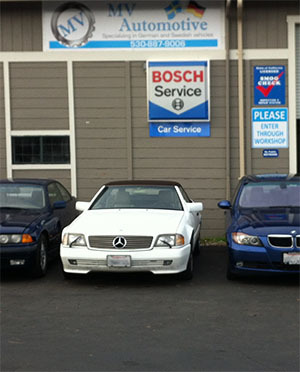 Our auto repair experts have built our reputation by providing consistently superior service here in Auburn. "On a scale of 1-10 I would give MV Automotive a 12. I brought my A4 to MV Automotive for an issue with my turbo. A different shop had recommended that I replace the entire assembly . Peter at MV Auto explained to me in detail how the turbo works and pinpointed the components affecting its performance, thus saving me thousands. I have since been back for minor repairs and have found my experience to be just as solid as my first visit. The staff is friendly and knowledgable, and the shop is clean. They"ll have a customer for life." "Pete rocks! He will figure out what is needed and do it with no bull. He gets the job done! And he knows what he's talking about too!" "This is the best shop we've found in the area for automobile service. We appreciate the quality work, and we are impressed by the intelligent analysis of problems and solutions. Pete Toro promotes a highly professional product and he leads his staff by example. We always feel that our vehicles are in good hands and our billing and paperwork is accurate and complete with great sensitivity to the finances involved." "They are the best ,fair prices and the best customer service in town!" "Excellent work and excellent customer service. MV Automotive has shown itself to have tremendous integrity. Peter is a highly skilled mechanic. I would trust them with my car completely. I have an old Volvo with many problems and Peter does his best to keep it running for reasonable costs that I can afford. MV Automotive is the most honest auto shop in the world!"